Happy Saturday! 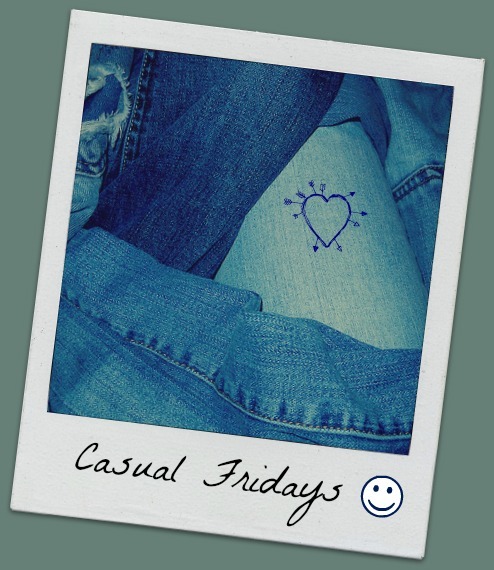 That means it is time for the latest installment of Casual Fridays (Saturday morning edition), my weekly chat post – no structure, no rules, no prompts, anything goes. And please also check out Casual Fridays over at Helen’s blog, Good Woman. Ah, another leisurely Saturday morning. My kids are at a sleepover and my husband is at work. I got up and put on yoga pants and an old t-shirt and was about to take Rusty outside to put him on the zipline. I opened my front door and I saw that my neighbors directly across the street were having a garage sale. People here get really excited for garage sales. They will camp out in your driveway at 5am (even if you post “no early birds.” Early birds don’t care). So what do I see this morning as I step outside in my lounge-wear and bed-hair? Total strangers pulling off the road and parking half in my yard to go browse the deals across the street. I may have had an octogenarian “get off my lawn” moment. Rusty’s zipline time also had to be cut short because the activity in our yard and across the street was giving him fits. My older daughter has middle school orientation next week. She starts sixth grade. Her fifth grade was technically middle school but they were in a separate building and didn’t have all of the activities the older kids did. It was more of a transitional year. Sixth grade is full-fledged middle school. She will be in the same building with the seventh and eighth graders. She will get to start band. Sports and cheerleading start too, but she’s not into those. The band room and cafeteria are actually in a building that the middle school shares with the high school. She will change classes every period. She will have a locker. There will be more dances and socials. I am not ready for any of this. My younger daughter starts second grade. Her new teacher is an old high school classmate of mine (who I actually like, ha ha) and I’m hoping that is a sign of a better year to come. We did find out that her “boyfriend” is not in the same class so she’s pretty upset about that. Work continues to be busy and challenging but I am managing well. I had my first poor fetal diagnosis this week and I had forgotten how truly awful those are. My patient is distraught and she basically cries every time I talk to her. I’m not the kind of person who easily leaves work at work in these situations. I carry some of that with me, I worry about her. I wish I could lessen her pain but I know I can’t. I seem to be her go-to person to call so I guess I am helping her in some way. Thursday (the day I gave her the diagnosis) was the most draining day of my week. I came home from work that day to two loving kiddos and a husband who had made my favorite dinner and bought me some Dove chocolate. They cast some sunshine on an otherwise gloomy day and I have no words to express my gratitude. We have a quiet weekend on tap, just the way I like it. We may start some school shopping if I can muster the energy for it. The school supplies are easy, clothes and shoes are more difficult. My kids are both hard to fit and the new middle school dress code is ridiculous. School starts in just under three weeks so I have to decide if I want to be proactive or procrastinate. Procrastination is typically my default. Have a wonderful weekend and upcoming week, everyone! I can’t believe it’s school supply shopping time already. I’m not ready for our kids to officially be “middle school aged”. I still remember how our kiddos looked as babies and how looking back you can see hint of the faces they’d have growing up. Your girls’ eyes, so striking for an infant or a toddler, now just so beautiful on growing girls. My kids’ deep brown eyes looking like they just pierce you, still doing that now. The days and weeks seem so slow as they are passing, then you turn around and realize years have passed in a mere moment. I hope the rest of your weekend is restful and the garage sale goers are too disruptive. I’m not ready for the middle school years either. What happened to our little babies? I still remember way back in the day sharing baby pics and talking about their baby/toddler milestones. How did we get here so fast? Change is hard I guess!